Our BURRITOS! PALOOZA celebrating our new cookbook continues with this amazing Frito Pie BURRITO! in a jar. Seasoned ground beef, whole beans and cheese is the perfect combination for rolling into a BURRITO! and an absolute natural for carrying to work in a jar. The week long BURRITOS! 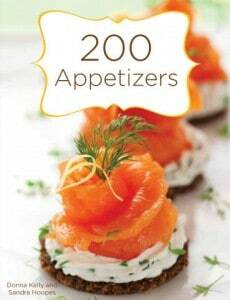 Palooza features sample recipes from our new book (to give you a taste of the amazing recipes inside) and a giveaway. That’s right, we are giving away 3 BURRITOS! cookbooks to fans and readers just for fun. To enter, just follow this link and leave a comment on the post featuring the Old Wold Posole BURRITO! Yep, it’s that easy! The 3 winners will be announced next Wednesday, October 28,2015. The star of today’s show is New Mexico Frito Pie BURRITO! from the All-American Classics chapter. This bonafide Southwest Original from down New Mexico way has traveled the country and become famous at State Fairs and Carnivals. It is actually a family favorite around these parts and is one of my mother’s favorite recipes from her childhood. BURRITOS! gives Frito Pie a modern update with fresh ingredients and rolls them into a warm flour tortilla. 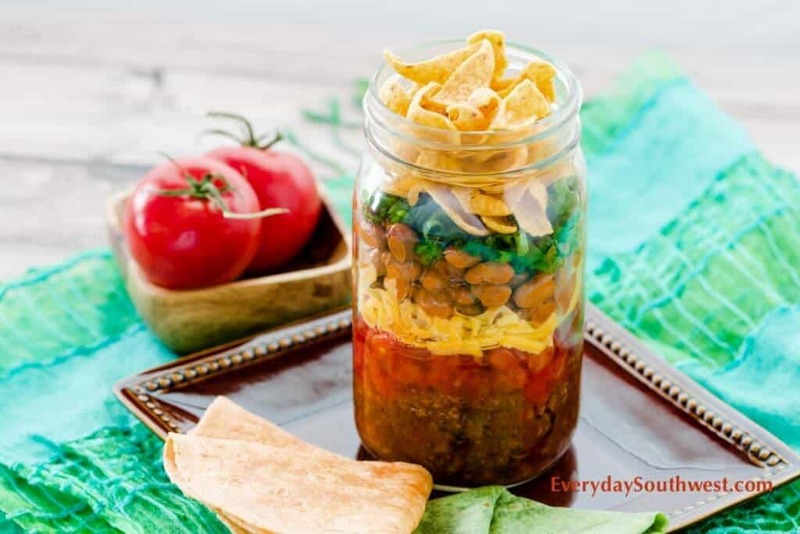 We have chosen to present this BURRITO in a jar so it can be easily carried to work or picnics and rolled into the tortilla when you are ready to eat. I love the crunchy Fritos that gives Frito Pie its name. If you are packing this BURRITO for lunchtime or to travel, you will want to carry the Fritos separately so they don’t loose their crunch. And YES! roll them into the BURRITO! I hope you love this recipe! It really is a family favorite that should please everyone at your table. Don’t forget to enter the BURRITOS! 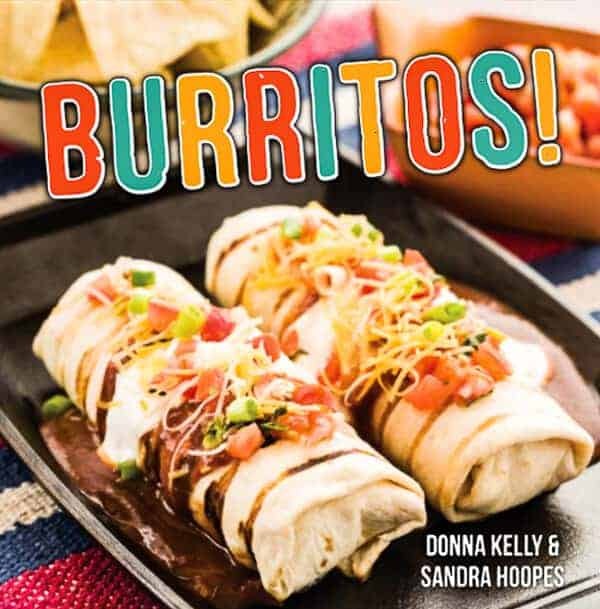 cookbook giveaway by leaving a comment on this Old World Posole BURRITO post. Be sure you sign up for my email updates so that you don’t miss a single new recipe. You will find the link at the very, very top of the blog. If you have any questions, you can always leave me a comment on any of the posts or, you can also “like” Everyday Southwest on Facebook and leave a comment there. salt, and spices. Add in tomato sauce and diced tomatoes with chiles over high heat and bring to a boil. Reduce heat to low, cover and simmer for 20 minutes. Add beans, cover, and simmer, about 15 minutes, until most of liquid has evaporated. Assemble burritos by spooning beef mixture onto tortillas. Top with cheese, onion, and Fritos. Roll burritos as desired. Or, layer the ground beef, tomatoes, cheese, beans and green onions in a jar. When ready to serve, heat and spoon onto warmed tortillas then, add Fritos and roll into burritos. That is pretty and looks good too! OMG Thank you for sharing this! It looks absolutely amazing! I gotta try this looks so yummy! Thank you for the recipe. I know that I would like this. We may try it out this next week. What a fun and creative way to serve burritos. This is such a neat and cool idea for the Holidays. I will be doing this one for sure. LOVE IT! 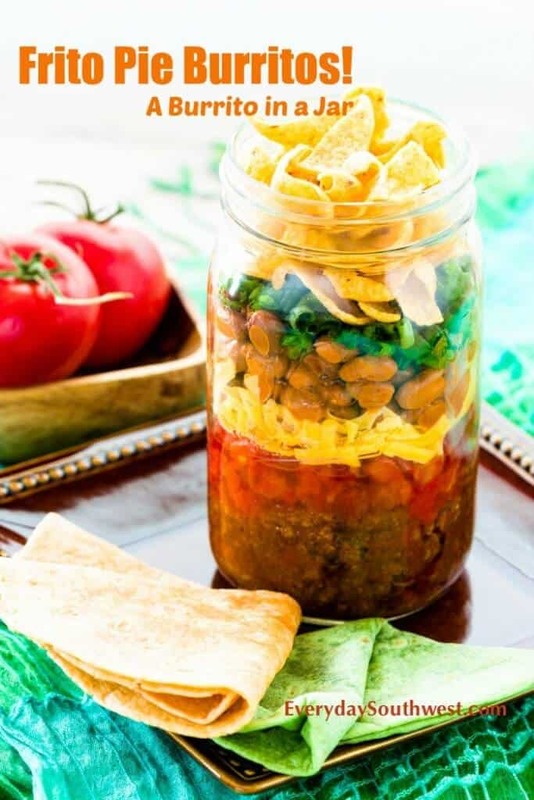 I’m convinced putting things in cute jars makes everything better…even burritos! This would be great to make a Taco salad at work. I think I would keep the chips by themselves to keep them from getting soggy. Thanks for sharing. Love the idea for work lunches, saves a bunch of dollars…Thank you for sharing. I love this idea! We make tacos and burritos quite often but I hate taking them to work the next day using so much tupperware, this would be so much easier!! I can not wait to give this one a try. It not only looks pretty but I bet it tastes good too! I definitely have to try this recipe. This sounds so yummy, I have seen a recipe similar to this one, but this one looks so more appetizing. Thank you for sharing.